Established and directed by Eva Cantarella and Alberto Maffi, DIKE was printed for the first time in 1998. Since it is the first journal entirely devoted to Greek and Hellenistic law, it publishes essays on Greek law and institutions from Mycenaean times to the Roman conquest. Due to its international dimension, Dike greatly contributes to the knowledge of a fundamental aspect of Greek civilization. 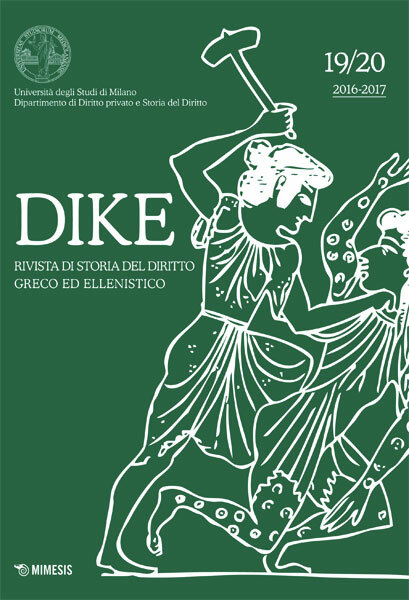 In the intention of its editors in chief, DIKE spreads and broadens the academic research published in the Proceedings of the Conferences on Greek law periodically organized – with the name “Symposion” – by important European and American universities since 1971. The members of the organizing committee of the Symposia are part of the scientific board of DIKE, which includes also other important scholars in Greek law, both Italian and foreigners. According to the specific features of ancient Greek law, the journal DIKE is open to the contributions of legal historians, Greek historians, philologists, archaeologists, epigraphists, and in general of all the scholars whose research deals with Greek society and economy, on condition that the topic discussed in the essay is of legal interest.